Hi. We install TV's AND HOME THEATERS in Dallas. P.S. - We're really good at it! TV Installation Dallas is better known as Copper Castle. Don't let that confuse you though, we are one big happy family and we're here to help. We would like to formally welcome you to our little slice of the internet. We’re glad you visited, because we love what we do, and we love telling people about it. We’re not just being full of ourselves when we tell you that we’re the best TV mounting service in Dallas, and pretty darn good at just about anything else you need when it comes to home entertainment systems. We didn’t get into this business to be number two! When we come into your home to install your flat-screen TV, set up your home theater, home automation system, or anything else, we get the job done quickly, efficiently and at a reasonable price. You can watch us work if you like (we don’t mind being admired!) or just go about your business, secure in the knowledge that everything will go exactly as planned. Then we’ll clean up, show you how to use your new electronics, and be on our way. We’re happy to offer you a free estimate, so call us at (214) 979-7334 or fill out our awesome instant quote form on any page. Now, let’s talk a bit about what we can do for you. This is just a bit of an overview; you’ll find more detail in our Service pages. This is our bread and butter, we specialize in flat screen TV installs. Don't worry we're not a one trick pony, but installing TV's is our jam. 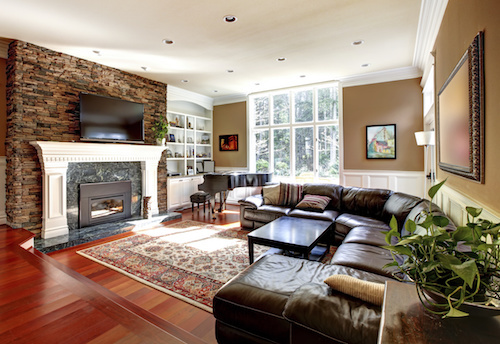 We do wall mounting as well as ceiling and pole mounts, and despite what you may have heard about fireplace mounts, most of the time we can do that for you as well without risking any damage to your expensive electronics. We do outdoor installation too, so if you’re creating a living space out on your patio and you need TV, a sound system, or both, fear no more! Interested in home theater packages? You might want some help with hooking up and configuring all your devices. We have tons of experience installing home theaters in Dallas and the surrounding area. There’s no such thing as a device we don’t know inside and out, so if you want your TV, cable or satellite box, selectors and splitters, audio system, DVD or Blu-Ray, Nintendo Wii, Playstations, Xboxes and so on working perfectly with no headaches on your part, give us a call. We’ll get everything connected for you, and make sure you know how it all works together with the universal remote system. Pre wire now. Save later. There are a million and one reasons why you should pre wire your new build or remodel using low voltage structured wiring. It's the best way to future proof your home to ensure that you'll be able to keep up with the fast paced world of technology. Pre wiring will give you the ultimate flexibility when it comes to audio, video, security, and home automation now and in the future. Luckily we provide a well respected and proprietary solution that our customers absolutely love. Click on over to the Pre Wire page to learn a little more. Or even better just call us now. Surround sound can totally change the way you experience TV, movies and music. If you’re ready to switch up your home theater package, you're in luck Jack, because we've got your back (And we rhyme? Bonus!). We can do a single room, or install surround sound in every room in your house if you like. We’ll take a look at your room dimensions, and locate the right speakers with an eye towards optimal sound and aesthetics as well. You won’t have to worry about unsightly wires – we can hide them. The only thing we don’t hide is our great prices, and we’ll be happy to give you a binding quote. So, whether you’re looking for a complete new install or a re-work, we’ve got you covered. A quality home automation system can manage your lighting, thermostats, home entertainment, and more with just the touch of a button. Even better, you can control your entire system from your smartphone, tablet, or any remote computer – you don’t have to be at home. You could even be thousands of miles away, as long as you have Internet access. We offer flexible, scalable home automation installs for your every need, at a reasonable cost. Yes, it's ok to do your happy dance now. When it comes to home viewing, bigger really is better, especially in Texas! We take pride in being the best home theater pros in Dallas TX, or anywhere else for that matter. You’d have to really, really want to see a movie as soon as it comes out to go to a movie theater when you can have nearly the same visual experience at home, without the chatters, texters, seat kickers … oh, and of course those people who’ve seen the movie before and need to tell you what’s about to happen! We offer projector and screen install options for every home, and can provide wall or ceiling mounts, or use your existing mount. In today’s home, you really can’t do without a reliable wifi network. You’re using so many different devices – smartphones, tablets, laptops and more – and you need to be certain that your signal is stable, strong, and of course secure. One of our tech pros (read: super nerds) will help you get the most from your wireless devices, and can add access points so that you can be sure of never losing coverage, whether you’re indoors or outside. At TV Installation Dallas, we love a challenge. We’re also pretty creative. So if you have an idea for a unique location for your TV, call us – we’d love to work with you. Want a TV installed over your fireplace, or in your outdoor living area? Got a great concept for your man cave? Well, of course you have – what guy doesn’t? Let’s talk. Flat screen installation is what we do, and we’re ready to tackle just about any custom project you can think of. How Do You Like Us So Far? It's ok you can be honest. You love us. We love you too! You can check out the rest, but then call the best (whoa that was corny. Who hired this writer?!). Anyway, you can reach us by calling (214) 979-7334 or filling out any of the contact forms on our site. We’ll help you get the most out of your home entertainment system. Pinky promise. When we do a job, it’s done and done right. But just in case we ever slip up (as if! ), we guarantee our work. We want you to feel secure and be able to sleep at night, so we back all our installations with our iron clad guarantee. Rest easy my friend. Rest easy. ​We offer not only design of home electronics installation but also, sales, expert home theater system installation and automation. Media rooms networks and home audio installation in Dallas that covers the outdoor living area, surround sound technology, in-wall speakers, ceiling speakers, and electronic systems is our specialty. Dallas TV Installers are the home theater system installers to turn to for outdoor, roof antenna, or personalized home electronics installation services to optimize your home theater performance. Our skilled home theater system installers in Dallas, TX, are quite helpful to the residents who need proficient home or business whole house audio installation offering seamless streaming of audio broadcasts. We carry out home electronics installation services that no other local home theater installers in TX can match. No wonder we are the official dealers of the global audio equipment manufacturers including Sony, Samsung, JVC, Niles, Sonance, Sanus, Viva Technology, Onkyo, and Polkaudio. Our home theater installation prices are the best in Dallas. If you need home electronics installation services from an insured and bonded whole house audio installation company, contact Dallas TV Installers. We provide a 2 year warranty on all installations. For a free quote on home theater installation prices that beat the big box stores.